Bathrooms in Bateig natural stone. The perfect choice! Bathrooms in Bateig natural stone. A perfect choice for any decoration style. Bathroom is an indispensable zone in any type of building, whether public or private. Current trends show us spacious bathrooms with basic but detailed furniture. Bateig stone can be used on the floor, walls, shelves… etc. Bathrooms designed with natural stone Bateig are distinctive. The variety of this type of stone allows us to create the different spaces in the same room. It is possible to create furniture contrasts, and always with spectacular results. If you have enough space, why do not create a comfort zone with a lovely couch? Bateig stone is very versatile and adaptable to any style. Natural materials are a rising trend in decoration. Therefore, private bathrooms in Bateig natural stone will be a great success. Its look with neutral colours will create a relaxed atmosphere; from where you do not want to leave. It is perfectly combinable with different materials, such as brass and gold. 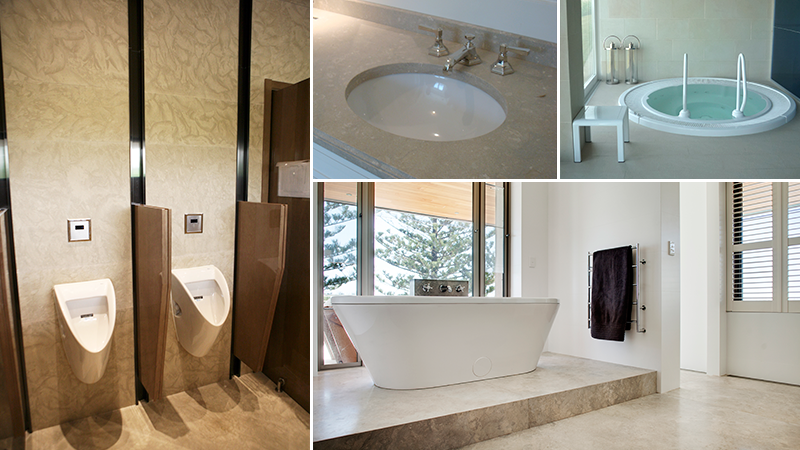 Minimalist and functional, majestic and opulent bathrooms… all aesthetics are suitable for Bateig natural stone. And what we can do with natural stone in our bathroom? Depending on the space and style that you want to achieve, this material can be used both on the walls or the floors, and also as pats of the basic furniture, like sink, foot bath, even bathtubs. While the Bateig natural stone it is porous, it is treated with special waterproof products, which highlights the natural beauty of this material, making it more resistance for daily use of the bathrooms. These treatments ensure that the colour, the consistency and the texture of the Bateig natural stone are not altered. This stone adapts perfectly to the climatic changes too, and it has a high resistance to impacts and high temperatures. Cleaning and maintaining Bateig natural stone it is very easy. Except to specific stains, you will just need neutral soap and water. If you need to end with concrete stains, we recommend you to consult with the distributor company to know the best treatment to be applied. Pureness, minimalism, quality and sophistication. Bathrooms in Bateig natural stone will not leave you indifferent.